Graeme discusses the new Homeplug AV2 technology, and how it’s breathing new life into powerline extenders. Last month I talked about my experience at the Intel Extreme Masters gaming competition, and it caused me to dust off some of my old games and relive some of my misspent youth. Of course, for Pro Gamers, let alone semi-serious gaming enthusiasts, the word ‘wireless’ is an anathema, from their mice, their keyboards, even many of their headsets are running good old-fashioned wires back to the PC itself to minimise any potential lag between their super-slick reaction times and the impending death of their on-screen counterpart. It’s the same for many of their devices at home. You and I, on the flip side, are more than likely very happy with the freedom that going wire-free provides, giving us the convenience of having a clutter-free desk, easy recharging capabilities, and simply being able to pick up your gear and move about, taking home your mouse, even your entire laptop when needed. For many of us, without wireless equipment, we would be back in the dark ages it seems. Wi-Fi networks also provide us with similar convenience, but Wi-Fi networks to Pro Gamers are almost unheard of. Competitions such as the recent Australian E-Sports League’s University Cup that was held at Sydney University last month have Local Area Networks running Gigabit to each PC, often with 10Gb backbones between the switches, to completely eliminate any latency from the network between each PC connected to it. But at home, in particular if you don’t have the option to drill through walls to run Cat5E or Cat6 Ethernet cables throughout the house, then what does a gamer do? Settle for Wi-Fi, even with the speeds that are now available on some of the high-end Wi-Fi gear? The option that many Gamers are turning to is PowerLine technology. PowerLine has actually been around for a long time, coming up to 18 years in fact, and in Australia there was a lot of hype around the second generation of the tech, called Homeplug AV in the early part of this decade. 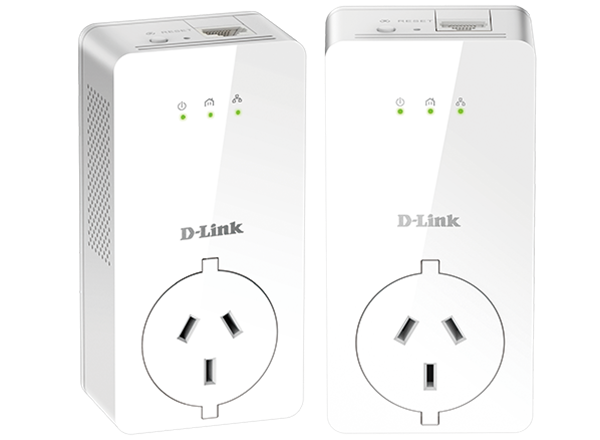 PowerLine essentially allows you to run your Ethernet data across your electricity network simply by connecting a couple of PowerLine adaptors that ‘talk’ to each other by plugging each of them into a standard power socket. The devices are usually paired together from the factory, with built-in security, so that the set-up experience is literally plugging in the pair of adaptors, connecting one of them to your router via a supplied Ethernet cable, whilst the other unit can be positioned up to 100m away. However, with many Australian homes often having multiple electricity circuits, consumers often found that a pair of Homeplug AV devices connected to power sockets sitting right next to another, or opposite sides of the wall, wouldn’t talk to one another. This was a definite downside in this generation of the tech, and it left a sour taste for many people. However, PowerLine has been having somewhat of a renaissance over the past few years, since the advent of the latest generation of the technology, called Homeplug AV2. The big difference is that this latest update of the standard allows data to move across multiple circuits far better than the early tech, as well as vastly improving speeds. In fact, with some of the high-end gear, such as the D-Link DHP-P701AV, you can approach the speeds possible via an Ethernet cable, allowing you to stream multiple 4K or High Definition movies across your home, whilst simultaneously fragging your competition, with imperceptible delays, even to the best gamer, without any of the variables that Wi-Fi inherently has. The AV2 technology also allow up to 16 adaptors to be used across a home and adding them to your existing network is super simple too, allowing any home to have high-speed connectivity wherever a power socket is located. Top that off with the fact that some units even have Wi-Fi built-in, so you can have the best of both worlds - A high-speed backbone of PowerLine throughout your home, with the benefit of extending your Wi-Fi network too, if that’s what you need. For those that are after a simple, elegant and high-performance upgrade to your network, don’t look past the power of PowerLine.